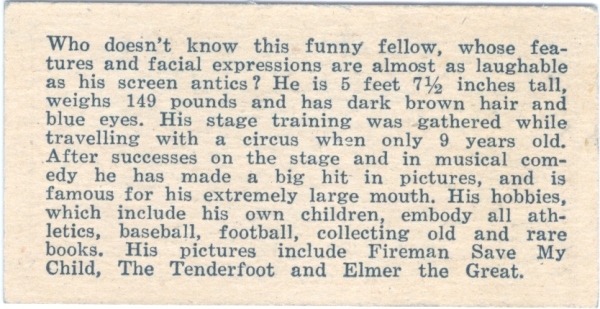 I'll say they were a mystery all right, this is an update of an old page on the site for an anonymous set of cards which have now been identified by Jim Davis as having been issued by Cracker Jack! 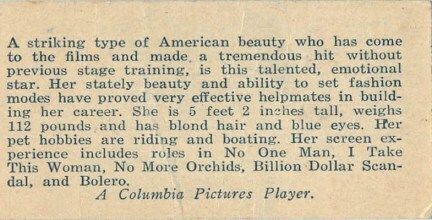 Jim went above and beyond in providing details, most of which will be briefly summarized here but you can find an extreme amount of detail about the nature of this set over on his Cracker Jack web page, plus adding another 3 images to our existing Gallery, bringing the total display to 19 29 different cards. 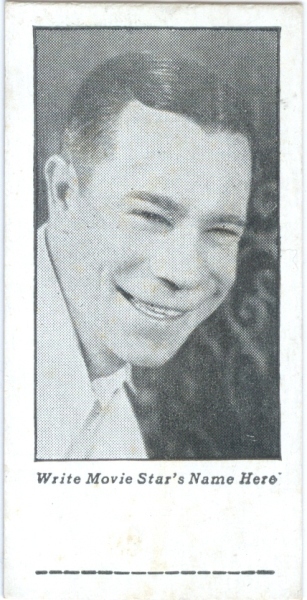 Previously I had no idea of how many cards were even in the set, but Jim has confirmed the number to be 32* 33! 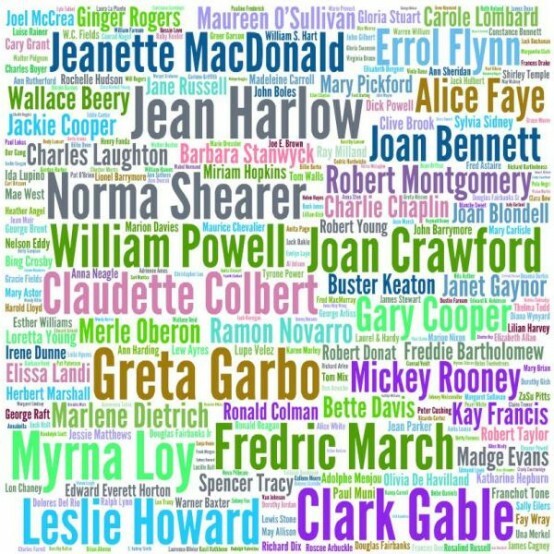 So we're still missing 6 images, but all 33 of those names appear on the checklist below. 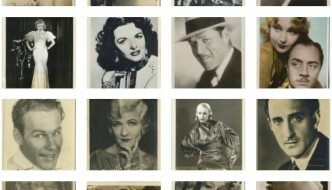 If there are more than 33 nobody has yet to report the cards. 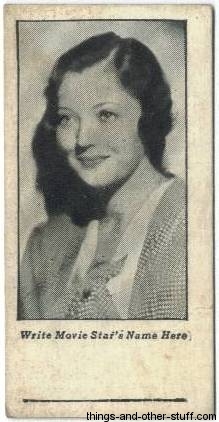 * Cracker Jack period documents state that it's a 32 card set, yet we've somehow accounted for 33. 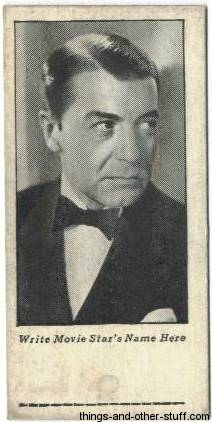 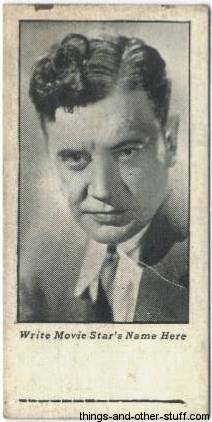 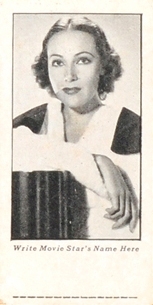 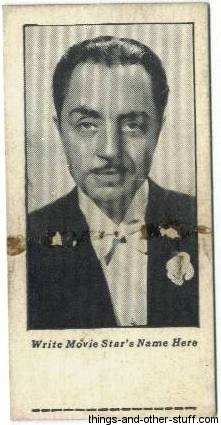 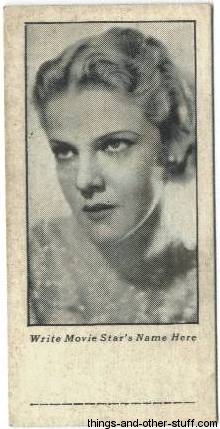 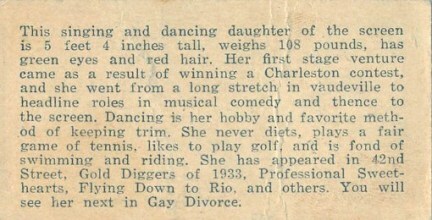 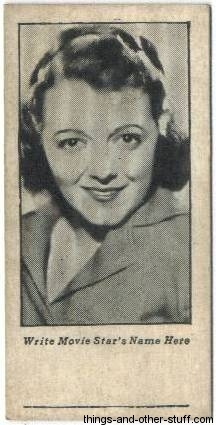 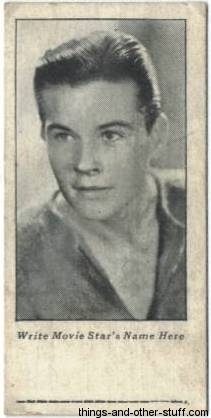 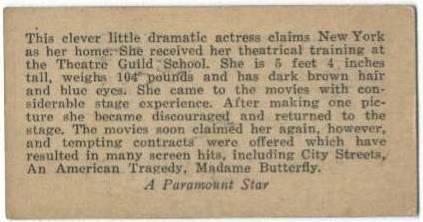 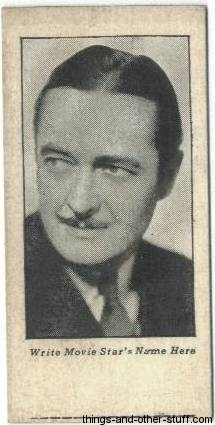 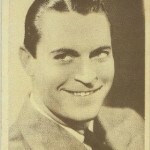 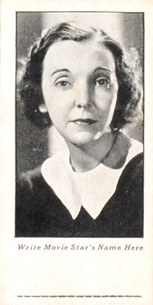 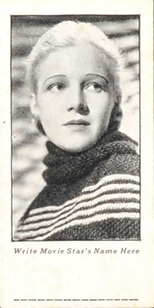 These cards include a description of the movie star on back and a black & white picture on front. 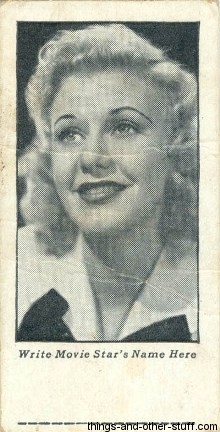 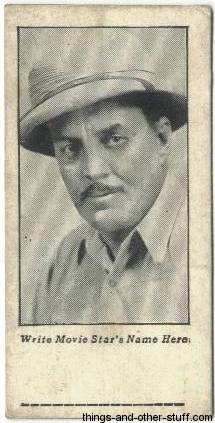 Beneath the picture is the text "Write Movie Star's Name Here," with a line below for the collector to do so. 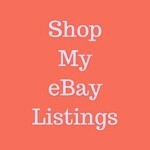 Each card measures approximately 1-3/8" X 2-3/4". 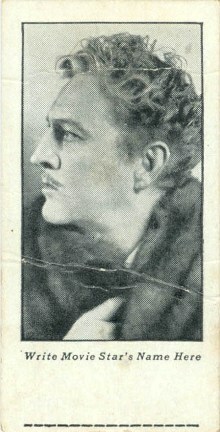 Printed on heavy card stock. 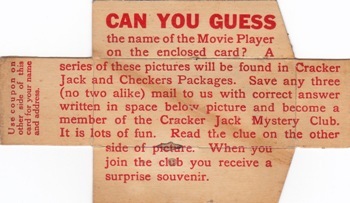 Again, this is all further explained in greater detail on Jim's Cracker Jack pages, but basically it would cost you three correctly identified Mystery Club Movie Cards as the price for entry into the Cracker Jack Mystery Club. 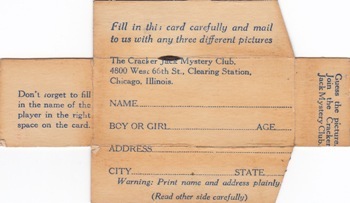 Redemption would result in receipt of a letter on Cracker Jack Mystery Club stationery, a gift, and a certificate. 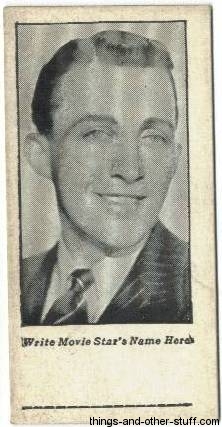 Personally I'd have rather kept the cards but I can easily imagine that if your pals were members you'd be in a hurry to send off three cards to gain entry yourself! 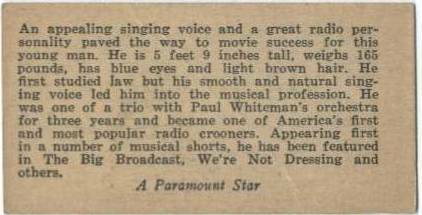 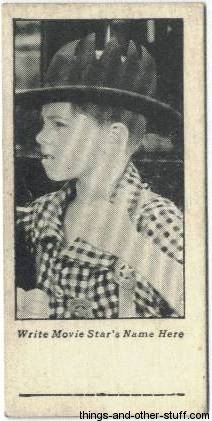 Jim notes that this promotion was run from May 1934-December 1, 1934, but extended into 1935 on the West Coast. 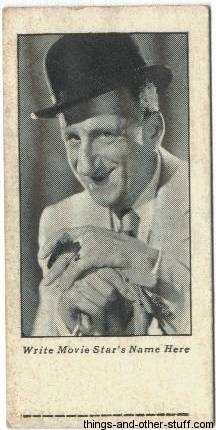 You can view Jim Davis' entire Cracker Jack Prize Archives pages from this entry. 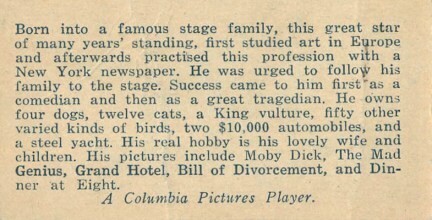 * Not pictured in Gallery above, but confirmed by Jim Davis. 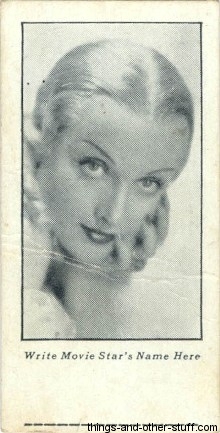 The Mae West card was auctioned by Hake's Americana in Auction #204.